I began with a Pilsner from the rotating tap (sorry don’t remember which one) and the Grilled House-made Sausage with lentils du puy and soft boiled egg. 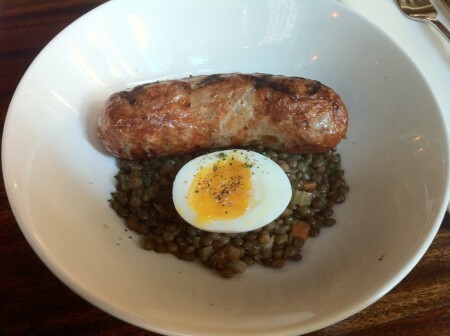 The house made sausage tasted very fresh and paired well with the lentils and egg. My main dish was an off the menu special, Squid Pasta with spicy tomato sauce (unfortunately don’t remember the details – iPhone notes lost). It was quite filling and not too spicy. The squid was very tender and well cooked and it was overall a great tasting, simple dish with fresh ingredients. Thanks again to the staff for recommending Bisato, where I ate the night after. Tags: Beer, Chocolate, lentils, Pasta, Sausage, Seattle, Squid.